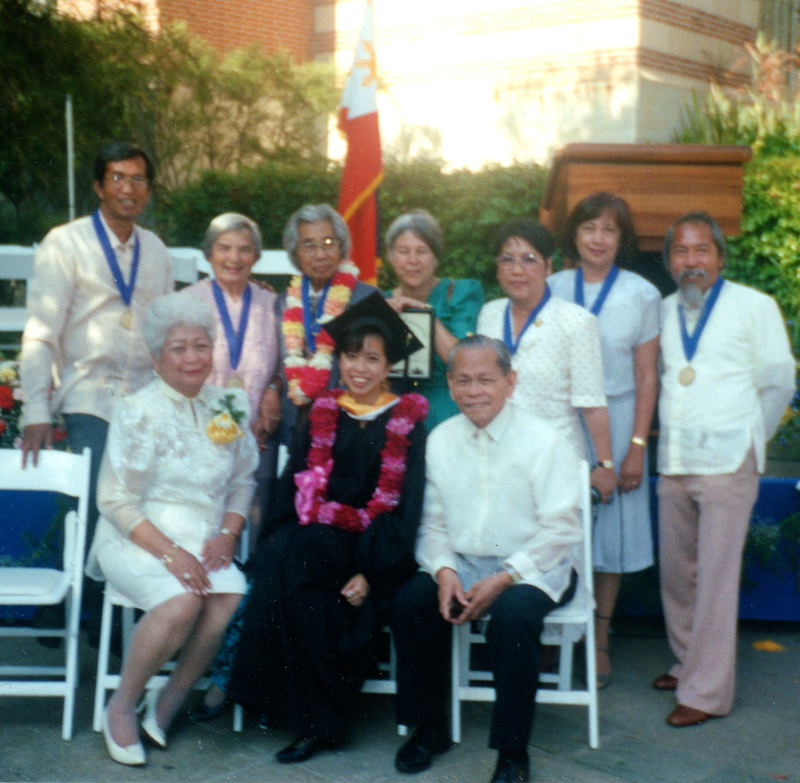 UCLA Pilipino Graduation 1993. Standing L-R: Enrique de la Cruz, Helen Brown, Philip Vera Cruz, Debbie Vollmer, Steffi San Buenaventura, Tania Azores, Royal Morales. Seated L-R: Emma, Emily, and Vincent A. Lawsin. I feel deeply blessed to have been taught and mentored by amazing pioneers in Filipino American Studies. Many of them appear in photos and other entries on this blog. On January 25, 2011, we lost one of the most dedicated and inspiring Pinay elders: Helen Agcaoili Summers Brown, founder of the Filipino American Library (FAL) in Los Angeles. She was 95. Tomorrow, March 19, at 2PM, FAL will host a Community Tribute to “Auntie” Helen at the Filipino Disciples Christian Church and I wish I could be there. Auntie Helen taught me (and everyone she met) the importance of preserving our Philippine and Filipino American history. I met Auntie Helen at the very first conference of the Filipino American National Historical Society (FANHS) in Seattle, in 1987. Auntie Helen had traveled all the way from Los Angeles for the conference. As a young student at the time, I remember being awestruck by her claim to have been the first-known Filipina woman to graduate from UCLA in 1937. As a member of the FANHS Board of Trustees, Auntie Helen attended every conference after that, for several years, all over the U.S. (often with her cousin Helen Ward). In 1990, Auntie Helen organized the first meeting to establish what is now known as the Los Angeles Chapter of FANHS. When we officially chartered the FANHS-LA Chapter in 1993, Auntie Helen was a founding member and staunch supporter, with all sorts of ideas for co-sponsored events and co-curricular programs. 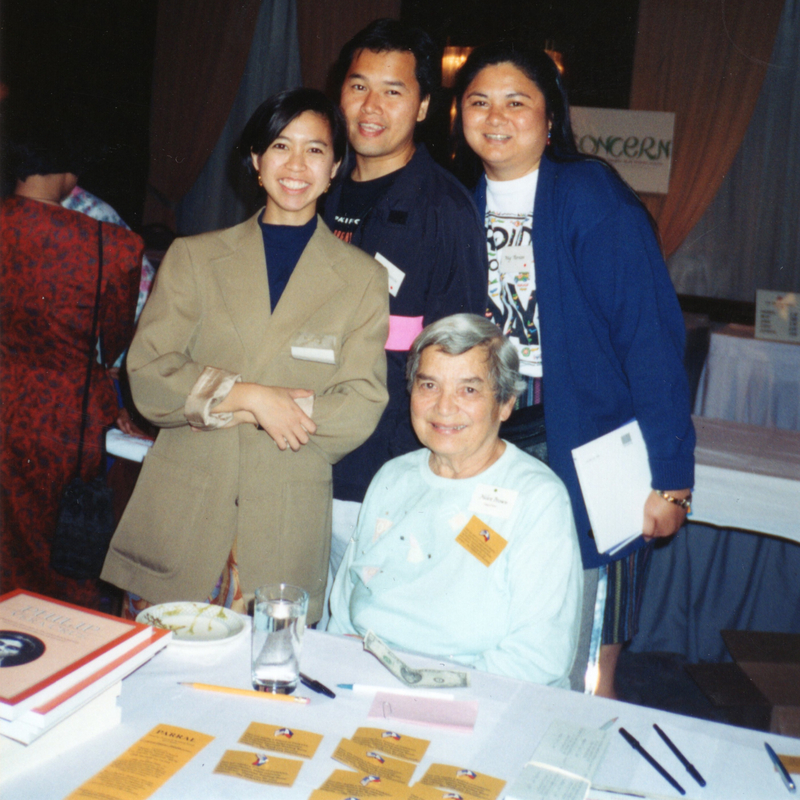 August Espiritu, Meg Thornton and I helped Auntie Helen sell US-Philippine Friendship Flag pins as a fundraiser for PARRAL, along with Philip Vera Cruz's autobiography, which August helped edit when he was a student. FANHS Conference, Chicago, 1992. When I moved from Seattle to attend graduate school in Asian American Studies at UCLA, Auntie Helen was one of the first community leaders to embrace me and teach me about Filipina/os in Los Angeles. She invited me to PARRAL, the Pilipino American Reading Room and Library (the precursor to what is now known as FAL), which she founded in Los Angeles in 1985. I remember entering PARRAL, which back then, in 1991, was just a small room in the basement of the Filipino Christian Church on Union St. I think I was with Cathy (Pet) Choy and August Espiritu, who were also Filipino American graduate students at UCLA (and who are now tenured professors at UC Berkeley and University of Illinois-Urbana Champaign, respectively). As eager student researchers, we sorted through hundreds of Auntie Helen’s books, pamphlets, event programs, newsletters, and photos. I honestly felt giddy and overwhelmed, like I had just struck gold! I also felt like I was “back home”, in Seattle, because PARRAL, with its haphazard overflowing stacks of ephemera, looked eerily similar to the FANHS National Pinoy Archives, where I had volunteered as an undergraduate intern. So many of us who research and teach Filipino American Studies owe a great deal to Auntie Helen. She was not only a teacher and librarian, she was like a Lola, a grandmother, who gave birth to several generations of Pin@y students and community activists. In her early years as a teacher, she organized for bilingual education in the Los Angeles public schools. In her retirement, she helped with the early movement for the official designation of what is now known as “Historic Filipino Town” in Los Angeles. 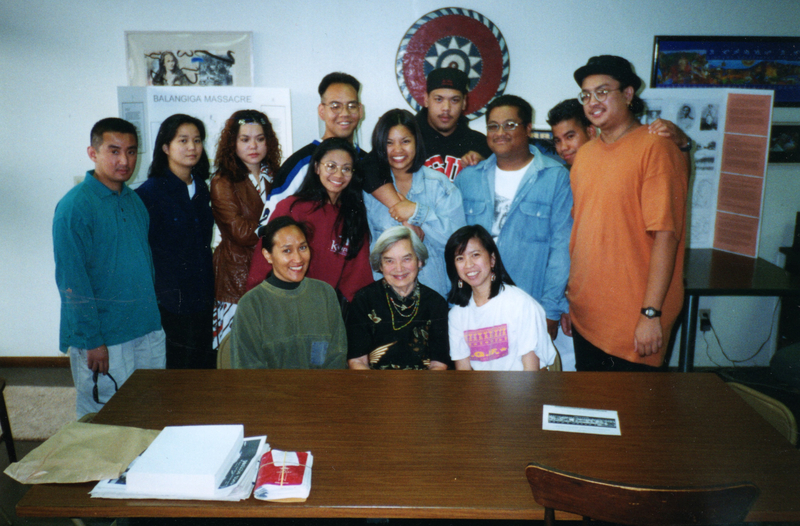 CSUN Filipino American Experience Class visits the Filipino American Library at its old location in Luzon Plaza 1995. When I started teaching Filipino American Experience classes at UCLA and California State University, Northridge, Auntie Helen was our favorite guest speaker. She would blow the students away (especially the young Bruins) when she would tell them that she was THE FIRST Pinay Bruin to graduate from UCLA. She always generously opened the doors of PARRAL when Uncle Roy Morales and I would lead class tours of Filipino Town. The CSUN students were one of the first to visit when PARRAL renamed itself and moved to its former and much larger location at Luzon Plaza on Temple Street in 1994. We had many events there and I even taught a series of Oral History classes in that space. We were all mesmerized by Auntie Helen’s stories of being “mestiza” in L.A, as she was the daughter of a Filipino mother and a white father, during the era of anti-miscegenation laws. She was like a walking history book. Now, as I teach Asian/Pacific Islander American Studies and Women’s Studies at the University of Michigan, I think of Auntie Helen often, wishing that this new generation of students would be so blessed to hear her unique laugh, to hear her shaky voice, and to touch the pages of history that she always generously shared. In our academic and community work, we do our best to honor Auntie Helen’s legacy. Maraming salamat po, Auntie Helen, for everything you did for me and everything you did for Filipinos worldwide. Thank you to your pamilya for sharing you with us too. Mahal kita. HELEN BROWN DOCUMENTARY ON YouTube! I love watching this film, which includes a lot of my mentors, friends, and kababayans from L.A. (and a photo of us FANHS Pinays with Auntie Helen at the Rock in Morro Bay). MARAMING SALAMAT, Florante!